How long have you had Weimaraners? 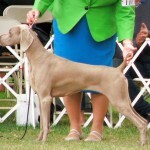 The longer a breeder has had Weimaraners the deeper their level of commitment. 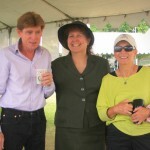 They are in it for the long haul with the goal of improving the breed. They feel responsibility toward the breed, toward the dogs they bred, the dogs they hope to breed and also to all the people who have dogs of their breeding.Do you raise other breeds besides Weimaraners? It takes an astounding amount of time, energy and money to devote to one breed. Raising more than one breed may not do justice to the Weimaraner. A breeder of multiple breeds could stretch themselves too thin. Be cautious of breeders who always seem to have puppies available or on the way. The “backyard breeders” and “puppy mills” are mainly motivated by the desire to make money. They are truly a business of selling puppies to anyone who will pay the price. Can I see the puppies parents when I visit? Be cautious if you are told “no”. It could be the parents are in poor condition or have an unsuitable temperament. Weimaraners should be friendly, outgoing and curious–not shy, growling or skittish. Please note, however, that may reputable breeders send their females to a sire in another area of the country to improve their breeding program. In that case, the reputable breeder has already evaluated and approved the sire’s temperament. Can I visit the puppies and see some of your other dogs? The breeder should be willing to show you the dogs and their facilities. Check to see that the puppies are raised indoors, in clean sanitary conditions and fed a high quality food. Remember: “You are what you eat”. What are the genetic problems Weimaraners can have? A reputable breeder should be able to explain these in easy to understand terms. What sort of health and temperament guarantees do you provide? A reputable breeder will provide a written contract outlining the buyer’s and seller’s responsibilities. What sort of competitive and performance events do you participate in with your dogs? 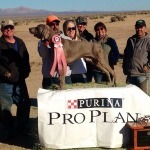 A reputable breeder will be actively involved in one or more competitive/performance events as a means of proving the versatility of the Weimaraner. A reputable breeder will rarely breed unless both parents have one or more titles in conformation, field, obedience, tracking, agility, etc. Are the puppy’s parents OFA (Orthopedic Foundation for Animals) certified to be free of hip dysplasia? Ask to see copies of both the sire and dam’s OFA certificates. Reputable breeders will not breed unless the hip certification is excellent or good. A dog must be at least 2 years of age before the hips can be certified. At what age may I take a puppy home? Eight weeks is the recommended age so a pup can learn dominance and submissiveness as a litter pack and be better adjusted around other dogs as an adult. Be wary of a breeder who sells puppies as young as 5-6 weeks. Will I get a health record and AKC registration at the time I purchase a puppy? The health record should show a recent worm check and a Distemper shot given at 6 weeks followed 2 weeks later with a Parvo shot. Our national Weimaraner Club of America recommends that the Distemper and Parvo vaccinations be given separately. Too many immunizations given at once can compromise a puppy’s immune system and cause lifelong medical problems. You should receive the AKC registration at the time you receive the puppy. 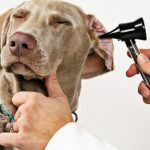 What type of maintenance care does the Weimaraner need? Ask about frequency of brushing, baths, tooth brushing, ear cleaning and toenail trimming. What dog organizations are you a member of? 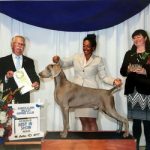 All reputable breeders will be members of our national club–the Weimaraner Club of America (WCA)–as well as a local breed club–Western Washington Weimaraner Club (WWWC) or Eastern Washington Weimaraner Club (EWWC). Members of the WCA have a Breeders Code of Ethics that includes many of the points covered on this Breeder Referral page. Breeders active and involved in the national and local breed club show their depth of involvement with Weimaraners. Could you give me names of previous puppy buyers as references? Be sure the check on the references! Please feel free to contact any of the SWC breeders listed on our breeder referral page; we’ll be happy to help!